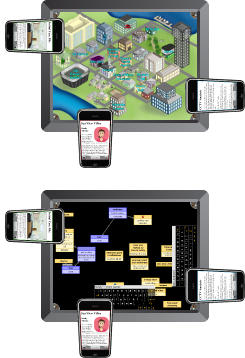 The Diamond Mystery is a collaborative game (i.e., players work together instead of competing with each other) developed to understand how configurations of shareable and personal devices affect the way people share information and, in turn, are able to collaborate in order to achieve a shared goal. Moving around the game board, our amateur detectives collect clues necessary to solve the game. Each detective receives his or her respective clues on an individual handheld device (iPod touch). To facilitate the creation of a shared external representation, we provide a multi-user concept mapping software for the DiamondTouch interactive tabletop. The mystery is played by groups of three. In our first study, we looked at how groups of adults worked together to share clues and ideas and solve the mystery. In a follow-up study, we asked family groups, consisting of an adult and two children, to solve the mystery. We are currently analysing this data and hope to report our findings soon.